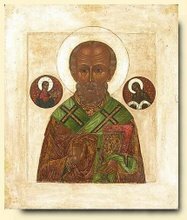 I interpret St John's language, all that taking off and putting on of vestments as a priestly act meant by the Apostle to remind his readers of the institution of the Aaronic priesthood. I used to wash any foot that turned up but now in conscience I think it would be a denial of what Christ intended and I can't do that. I am grateful I have the freedom to express my conscience. Before the invention of Pius XII the rite happen outside of Mass, and anyone could be involved, within Mass it takes on a Eucharistic meaning. I have been fortunate, there are many things I do or don't do because of conscience. Though I have used it I really feel uncomfortable about using that trattoria-written-back-of-a menu Eucharistic Prayer (EPII), in fact I have a problem with using one other than the Roman Canon. I don't consider them invalid, just not of the Latin Rite which since the time of St Gregory used this text. They are part of the hermeneutic of rupture, in conscience I don't believe it is possible to be Catholic and to be part of the rupture. I know it is a bit of a convoluted conscience but it is mine. I think it is very interesting that Cardinal Sarah felt it necessary to 'clarify' this issue, and to underline my right to be a conscientious objector, Will other Cardinals suggest that there is a conscience clause with regard the issuing of the Holy Father's post - Synod document? As much as I might welcome conscientious objection I can't help pushing people to the point of making such an objection is the beginning of schism. Yet if bishops and priests do not have a sensitive conscience have they anything to offer? An interesting video on the liturgy by CNS in which the scholar Father Jeremy Driscoll OSB, corrects some contemporary liturgical errors. Father Jeremy Driscoll OSB: at last, at last, at last, someone who talks real, deep sense and demolishes the false contradictions and caricatures on both sides of the liturgical in-fighting of the last few decades! And he talks with such a luminous synthesis of gravity and joy in his voice and in his face. Grace abounds still. Deo gratias. I just hope someone is listening. Hah. Our true primate: conscience. We who want to preserve anything, maintain any sort of continuity- whatever- we lose again and again. Now any bow to tradition is a bow of 'conscience', much like the idiot getting surgery in order to look like a female is a matter of 'identity'. This is the progressive march forward. I don't know if Cardinal Sarah even knows that; he may just think he's defending traditionalists, but this is classic progressive nonsense. The tradition was authoritative, now it is just some pang of conscience, likely just nostalgia (they'll say). The 'tradition' of the Mandatum - at Mass - is new going back to the father of reformers Pio XII. Which isn't really relevant to my point. Conscience is our new lord and savior, and anything we do gets reframed as obedience to that, rather than the Lord. You wrote: "I know it is a bit of a convoluted conscience but it is mine." Thus spoke Saint Thomas More long ago. Bravo! There were 12 apostles called by name by Our Lord. One betrayed him; one denied him; nine ran off into the night abandoning Him; and one stood at the foot of the Cross with our Blessed Mother. One. 'Conscience' is a term that can be bandied about forever and a day. I presume, however, for purposes of this discussion we are referring to a properly formed and well-informed Catholic conscience attuned to the doctrine, discipline, and sentiments of the Catholic Church throughout the millennia. Such a Catholic conscience is a sound guide for evaluating and assessing our spiritual life and practice and the guide for which we will answer to God one day. Fr. Driscoll was just elected abbot of Mt. Angel Monastery here in far-off Oregon. And bishop Schneider is right. The time has come, sadly, when clerics will have to start thinking for themselves, conscientious objection in a new form. For deciding whether they are orthodox Catholics or something else. Such is the chaos amongst our bishops. Effectively schism. I believe we are in the midst of a new reformation. Let's remember that the concept of a Reformation did not exist in the minds of Luther or Huss, and certainly not Henry, or any others. They simply came up with a whole series of different ideas some downright ridiculous, although they had the same obsession with Communion under both kinds and with the implicit denial of the Real Presence as we have today. It was 50 or even 100 years before this all settled selectively into what we now know as the Protestant Reformation. The one organisation which did not come up with silly ideas was the Unam, Sanctam, Catholicam et Apostolic Ecclesiam.. Convoluted, Father? Straight-on, I should think. What is convoluted is getting from Sacrosanctum Concilium to the present debacle in liturgy that has followed on the introduction of the Novus Ordo (the name itself is a dead give away). The rupture is a rupture indeed--unfaithful and disobedient even to the wishes of the Council Fathers. Being faithful to the traditions of the Church is a sign, according to the Apostolic Fathers and all who faithfully followed them, of fidelity to the Holy Spirit. Innovation was a very naughty word and a very bad thing until quite recently. During the So-called Reformation, "innovator" was an insult hurled by both side against each another. The notion of multiple Eucharisric prayers was born of disobedience, and for some biZarre reason, the Pope thought that giving in to disobedience would foster obedience! Fr. Driscoll is saying things that would not have been said in the 1970's or later without being punished. We have a situation in which the Holy See has recommended and imposed a liturgical deform imposed and formulated after Vatican II. Its all been a big fiat accompli and there is no way Bugnini and Consilium (his little loaded committee) stands up to scrutiny as being reputable, trustworthy and Catholic. They were not so how long will the sham continue. 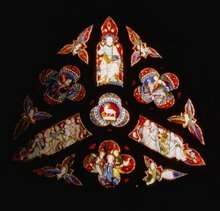 When will there be a true revision, restoration and if where required use of the vernacular with the pre 1952 liturgy as a starting point. I was appalled to learn that there is much in the Holy Week liturgy Bugnini just made up!!! That man there are no words to describe the falsification. 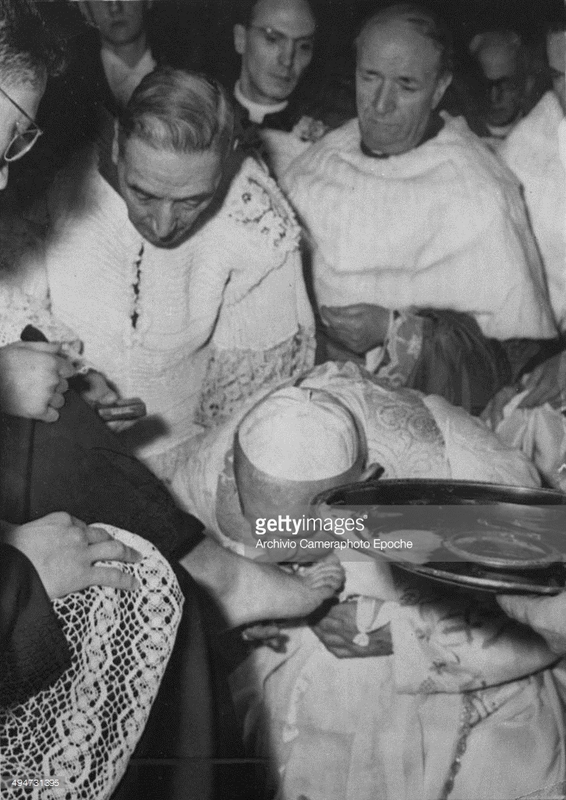 Priests should not wash women's feet at Mass; still less should they kiss their feet, as seems to be happening in the posted picture. I am specifically not talking about a sane definition that would make sense. Rather I am talking about the progressive definition. While they run the show, the sane definition doesn't matter. They take certain ideas, pervert them, and then weaponize them.